Day 1 : AIRPORT PICK UP LATER CARBYN’S COVE BEACH, CELLULAR JAIL LIGHT AND SOUND SHOW. Arrival at Port Blair in the morning/afternoon by flight and our representative will be waiting outside holding a placard with your name on it. You will be taken to your hotel where you relax and rest. After Lunch proceed to the nearest Beach, Carbyn's Cove. The Crescent shaped coconut palm fringed Carbyn's Cove ideal for swimming & bathing. Coastal drive to this beach is awesome, a stretch of around 4 Km with an open sea towards your left is a sight to experience. Take pit stops during this ride to click pictures and to explore the beauty. Later proceed to one among the most visited attraction in Andaman Islands, Cellular Jail. This jail before India's Independence hosted the most ferocious prisoners in the Andaman Islands. Today this jail stands as a national memorial. Visit to these historic attractions and know about the rich history of the Andaman Islands. Later attend the enthralling Sound and Light Show at Cellular Jail - where the heroic saga of the Indian freedom struggle is brought alive. Enacting of freedom fighters and their struggle for India's Independence is enacted during this trip. Post completion of this trip, we drop you back to your hotel. Day 2 : PORT BLAIR TO NEIL ISLAND BY PREMIUM CRUISE LATER BHARATPUR BEACH, SITAPUR BEACH & LAXMANPUR BEACH. Check out from the hotel and board a Premium Cruise to Neil Island, upon reaching the Island our representative will take you to your respective resort. Rest and then proceed to Bharatpur Beach and Sitapur Beach and Laxmanpur beach. Firstly, we cover, Bharatpur Beach. The closest white sand beach to Neil dock, Bharatpur beach. 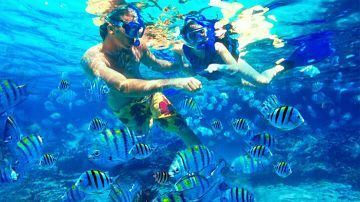 The reef here is still unexplored and travelers can avail snorkeling, glass bot-tom boats rides and Jet Ski rides here. Then, visit to Sitapur beach which is a perfect picturesque beach for travelers. We also visit Laxmanpur beach. Known as the sunset point at Neil Island, Laxmanpur beach is a vast open white sand beach. Post completion we drop you back to your hotel. Day 3 : NEIL ISLAND TO HAVELOCK BY PREMIUM CRUISE LATER RADHA NAGAR BEACH. Today we depart from Neil to Havelock Island. On arrival our representative will be waiting at the exit of the jetty. Then proceed to selected resort to relax. After Lunch enjoy the famous Radhanagar Beach. This beach has been consistently rated as one of the best beach in Asia. 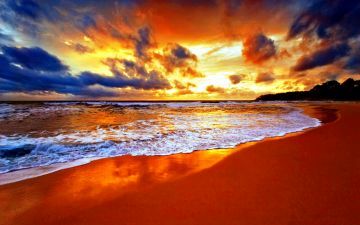 Watch a mesmerizing sunset on this beach before returning back to your hotel to relax and unwind. Day 4 : BOAT RIDE TO ELEPHANT BEACH -SNORKELING. 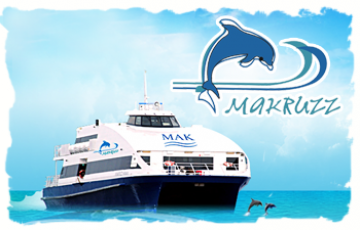 Today, we begin our journey to the most visited snorkeling destination in Havelock Island, Elephant Beach. Around 30 Minutes by boat, Elephant Beach flaunts one among the best reefs in Havelock Island. The great thing is that the reef here starts at a depth of less than a meter. Upon reaching Elephant beach, we rest and relax. 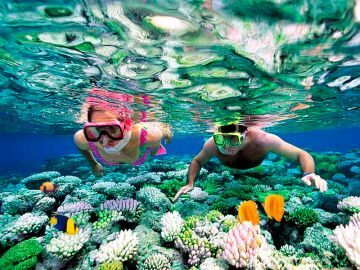 Later, our guide takes you to snorkel underwater where you explore the amazing reef in Elephant beach. Later we return back from Elephant beach to the Havelock dock in a boat. Upon arrival, we attend you and drop you to your hotel. Day 5 : KALAPATHER BEACH LATER HAVELOCK TO PORT BLAIR BY PREMIUM CRUISE. Today, we begin our journey to the Kalapathar beach. The drive to reach this beach is amazing. A vast open sea with turquoise waters is a treat to see and experience during your journey to Kalapathar beach. 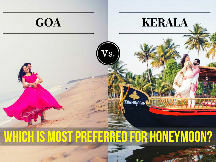 Post completion of this trip, our repre-sentative attends you and helps you board a Premium Cruise back to Port Blair. Up-on arrival in Port Blair, we attend you and drop you to your hotel. Day 6 : BOAT RIDE TO NORTH BAY ISLAND & ROSS ISLAND. Let's get back in time to visit the first Administrative settlement of the Britishers in the Andaman Islands, Ross Island. Earlier, said as the Paris of the past. This island today has ruins of all the luxury the Britishers had during that time. Visit this amazing destination and move forward on a boat to visit the Coral Island of Port Blair, North Bay Island. Infringe with rich marine life this island is the other most visited destination in Andaman. 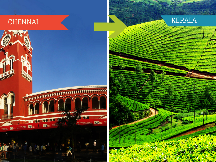 Upon Return from these famous destinations rest and relax. Day 7 : LOCAL CITY SIGHTSEEING LATER CHIDIATAPU BEACH-SUNSET POINT. 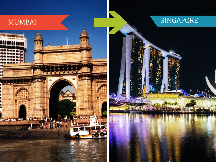 Start your day by visiting some of the best city attractions in the Andaman Islands. Visit the famous Chatham Saw Mill, which is amongst the oldest sawmill in Asia. The saw mill is named after this island. Then proceed to Anthropological Museum that hosts the tools, the pictures and the history of the aboriginal tribes in the Andaman and Nicobar Islands. Post this proceed to the Fisheries Museum and Naval Marine museums that host ieties of fishes in Andaman Islands. Take a break and refresh yourself with ieties of delicious food options in the Andaman Islands. Lat-er we begin our journey about 30 kms from Port Blair, to one among the best sunset point in the Andaman Islands, Chidiatapu. Watch a mesmerizing sunset by the beach, take some snaps and imagine the wonderful moments you spent at the Andaman Islands. Day 8 : AIRPORT DROP. Depart for airport. Return home with sweet memories of this exotic destination, the Andaman Islands. » Other Terms & Conditions, if any(optional): > Accommodation at respective hotels with breakfast and all taxes on double sharing basis. > All sightseeing by personal Vehicle. > All entry tickets, ferry tickets and permit charges are included. 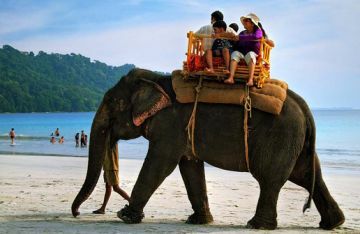 > Complementary Snorkeling for trips to Elephant beach in Havelock Island is included. 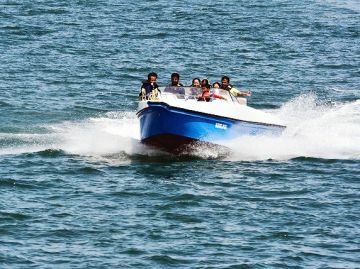 > Both side Private High Speed cruise tickets for Havelock Island is included. It was awesome. Andaman Reef travels provide me all which he has promised. All his sub broker are eqully good and available at prompt time. All hotels and resorts are as good as he promised.